Welcome to Michigan, the Great Lake state. Michigan is quite unique among the states in that it is divided into two distint geographic sections, the Upper peninsula, and the Lower peninsula. Lake Michigan lies between the two peninsulas. The Upper peninsula is very sparsely populated, more than 90% of the peninsula being forested. The Lower peninsula contains the cities, industry, and agriculture. The Upper and Lower Peninsulas were connected in 1957 with the construction of Big Mac, the Mackinac Bridge. Almost half of Michigan is comprised of water and, except for Alaska, Michigan has more shoreline than any other state, fronting four of the Great Lakes: Lake Superior, Lake Michigan, Lake Huron, and Lake Erie. With 3,177 miles of Great Lakes shoreline it is easy to see why Michigan boasts a thriving recreational industry, and leads the nation with approximately one million registered pleasure boats. 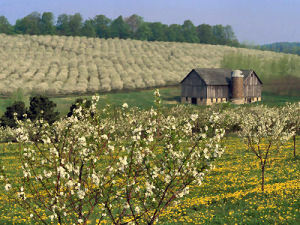 "Michigan, handsome as a well made woman, and dressed and jewelled. It seemed to me that the earth was generous and outgoing here in the heartland, and, perhaps, its people to a cue from it." The word Michigan originally referred to a clearing on the lower peninsula and was derived from the Chippewa Indian word "majigan" which means clearing. Lake Michigan was named after this clearing by European explorers in the area in the 1670's. The state later took the name of the clearing as well. It has been generally accepted that Michigan was nicknamed "The Wolverine State" for the abundance of wolverines that once roamed the peninsula. However, according to the Michigan Historical Center, wolverines were very rare in Michigan if they were present at all. It's not clear how this nickname originated, but there are two theories. Some think the nickname was originated by Ohioans in 1835 during a dispute over an Ohio/Michigan boundary called the "Toledo Strip." This dispute became known as the Toledo War. Though Michigan and Ohio both sent troops to the area, no shots were ever fired. It's said that Ohioans, at that time, referred to Michiganians as "...as vicious and bloodthirsty as wolverines." Another theory is proposed that Native Americans compared the way that settlers were taking land, in the 1830s, to the way the excessively greedy wolverine went after its food. or "The Great Lakes State", or "The Lakes State" nicknames have been applied to Michigan for many years. They refer to the fact that Michigan shores meet four of the five Great Lakes and to the number of inland lakes in the state. The four Great Lakes that border Michigan are Lake Superior, Lake Michigan, Lake Huron and Lake Erie. There are also more than 11,000 inland lakes in Michigan and, according to the Michigan Historical Center, one is never more than six miles from an inland lake or more than 85 miles from one of the Great Lakes. From 1968 to 1975 and from 1979 to 1983, the legend on the standard Michigan License Plate read "The Great Lake State." This legend recognizes the Great Lakes and more than 11,000 inland lakes found in the state. This legend was changed to "Great Lakes" in 1984. This promotional nickname again references the water resources of the state of Michigan. "Water Wonderland" appeared on Michigan license plates beginning in 1954. 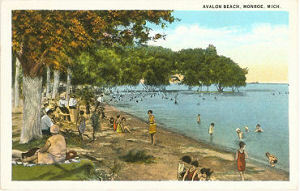 It was modified to "Water-Winter Wonderland" in 1965. This modified legend appeared on Michigan license plates from 1965 through 1967. With over 40,000 square miles of water surface within its boundaries, Michigan's history has been "saturated" with the association. "Lady of the Lake" is another nickname referencing the influence of water in the state. It is thought that this nickname may have been taken from Sir Walter Scott's poem, "The Lady of the Lake." This nickname draws attention to the automobile manufacturing that has played such an important role in the history of the state. People who live in Michigan or who come from Michigan are called Michiganians, Michiganders or Michiganites. Michigan (From Sea to Shining Sea) , Elizabeth M. Johnson. 80 pages. Publisher: Children's Press(CT) (March 2002) Reading level: Grades 3-5. Presents information about Michigan's people, geography, history, landmarks, natural resources, government, state capitol, towns and cities, and more. Michigan (World Almanac Library of the States) , by Rachel Barenblat. 48 pages. Gareth Stevens Publishing (January 1, 2002) Reading level: Grades 4-6. Filled with the most up-to-date information, including the latest Census results. Full-color photos bring to life the story of Michigan. In addition to an in-depth factual profile of Michigan in the form of a state Almanac, this book offers fascinating and lively discussions of the state's history, people, geography, government, economy, culture, and lifestyles. A section on Notable People, a calendar of events, and enough primary source documents, time lines, maps, and other tools to make this unquestionably the best young adult reference material on the USA available anywhere. Northern Michigan Almanac , by Ronald Jolly. 606 pages. Publisher: University of Michigan Press/Petoskey (July 8, 2005) The almanac centers around Traverse City and includes areas around Petoskey, Frankfort, Charlevoix, Ludington, and the major islands in Lakes Huron and Michigan. Author Ron Jolly brings interesting, little-known facts about geography, weather, tourism, agriculture, ecology, business, transportation, government, and more to light-for example, which movies were made in the region, where the ghost towns are, and why fruit in Michigan is such a big business. West Michigan Almanac , by Edward Hoogterp. 488 pages. Publisher: University of Michigan Press/Petoskey (October 23, 2006) Edward Hoogterp is a journalist with more than thirty year experience as a writer and editor at Michigan newspapers. Until his retirement from Booth Newspapers, Hoogterp was a state capitol correspondent. His coverage focused on the environment and such topics as agriculture, transportation, land use, and tourism. He lives in Beulah, Michigan. Michigan: A History of the Great Lakes State , by Bruce A. Rubenstein and Lawrence E. Ziewacz. 360 pages. Publisher: Harlan Davidson; 4 edition (April 30, 2008) Like all states, Michigan has grown because of the boldness, wisdom, strength, and creativity of its citizens. In the Third Edition of their popular text, Professors Rubenstein and Ziewacz have combined to present a different kind of state history, one that includes the traditional accounts - the impact of the French and British, the rise of the automobile industry, and the tales of lumbering and mining - but one that also portrays an unflinching account of the story of all the peoples of Michigan, with special emphasis given to American Indians, women's suffrage, and the contributions of white ethnics. Informed by the latest research and taking the Michigan saga right up to the present, this beautiful, well-illustrated book is certain to inform students and all those interested in the unique history of the Great Lakes State. Michigan, the Great Lakes State: An Illustrated History , by George S. May, Joellen Vinyard. 99 pages. Publisher: American Historical Press (October 15, 2005) Reading level: Young Adult. 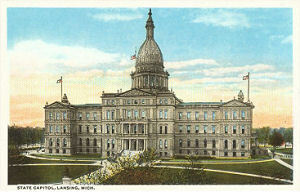 Michigan's rich history comes alive in this engaging tribute to the state. From early explorers, fur traders and farmers, to machinery, motors and manufacturing, and, ultimately automobiles that made Michigan famous this is a compelling account of the Great Lakes State. Michigan: A History of the Wolverine State , by Willis F. Dunbar, George S. May. 769 pages. Publisher: Wm. B. Eerdmans Publishing Company; 3 Rev Sub edition (July 1995) This standard textbook on Michigan history covers the entire scope of the Wolverine State's historical record. This third revised edition incorporates events since 1980 and draws on new studies to expand and improve its coverage of various ethnic groups, recent political developments, labor and business, and many other topics.